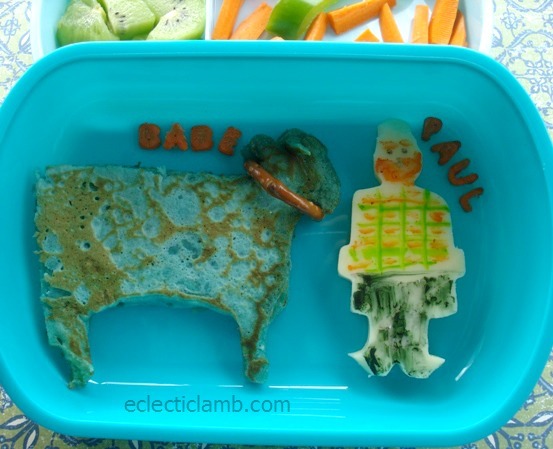 I made this meal for Paul Bunyan Day. Paul Bunyan was a lumberjack and an American folktale character. The story says that he had a blue ox named Babe. My 8 year old nephew actually had this for dinner at my house. My husband drew Paul’s flannel shirt and came up with the pretzel yoke idea. My nephew placed the letters. This was my first time using this box I bought at Target. 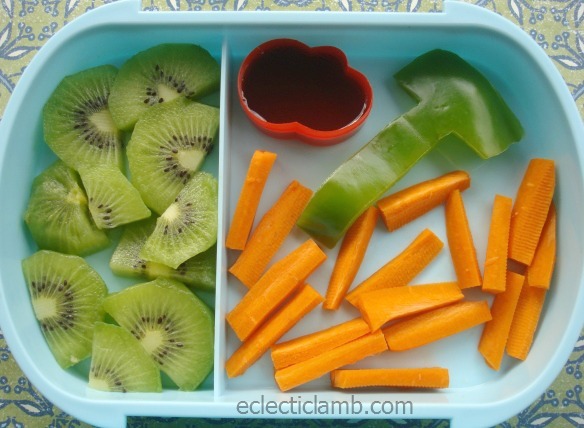 This entry was posted in Bento / Cute Food and tagged bento, pancake, vegetarian. Bookmark the permalink. This gave me a smile this a.m. Clever, very clever. That is a very cool pancake meal! The shape and texture for Babe’s body is great and tell your husband that his plaid shirt if perfect. I am sure our nephew loved it. I like the way the pancake makes babe look. I think this might be my favorite bento yet!